Soybean stem borer injury to leaves can be found in some south central Nebraska soybean fields. This beetle (Dectes texanus texanus) has been moving into Nebraska from north central Kansas over the last decade. The last few years soybean stem borer has been reported in soybeans in Fillmore and Clay counties and surrounding areas to the west, east and south. The adult is a gray, elongate beetle about 0.5 inch long with antennae that are longer than the body. Females lay eggs from late June to August on various plants, including cocklebur, giant ragweed, sunflower, and soybean. On soybean, eggs are primarily laid in the leaf petioles. Larvae feed on the pith and tunnel down into the main stem. Each of four larval stages tunnels up and down the stem. Initial damage is seen when larvae tunnel down the leaf petiole and enter the stem. The leaf tissue above this point wilts and dies. If you split the leaf petiole, you can see the tunneling and may still see the larva. Economic damage is caused primarily by lodging and subsequent harvest difficulties. Girdling is most severe in earlier maturing varieties, and lodging is most severe in earlier planted soybean. Chemical treatment of larvae is ineffective because the larvae are in the stem; effective chemical control of the adults is difficult due to the extended adult emergence period. Research found that burying borer-infested stubble after harvest can reduce Dectes populations. 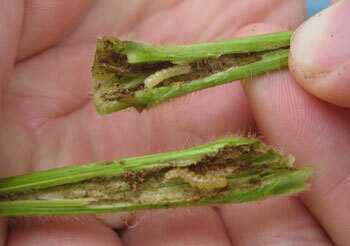 Entomologists at Kansas State University have been studying this insect as a pest on soybeans for several years. 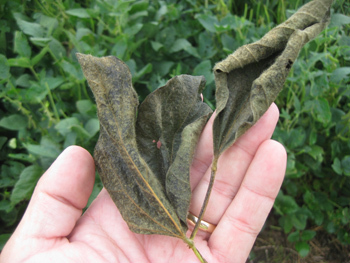 They have not identified resistance in any commercially available soybean cultivars, and labeled planting time and foliar insecticide applications were not effective. KSU has conducted a great deal of research on this insect. Its reports and extension publications are available online at Soybean Stem Borer. Fields with a history of injury or with symptoms this year should be carefully watched during August and September. Fields with extensive stalk tunneling by the Dectes stem borer are at risk for lodging and harvest losses, depending on weather conditions. Those fields should be targeted for harvest first to minimize harvest losses due to stem borer injury. In the absence of lodging losses, this insect does not usually cause noticeable yield reductions.